Call us 24/7 at 1-877-698-6264 to request services. When an aging or unwell family member's safety at home is a cause for concern -- no matter what the reason -- Visiting Nurse Association of Ohio can help. 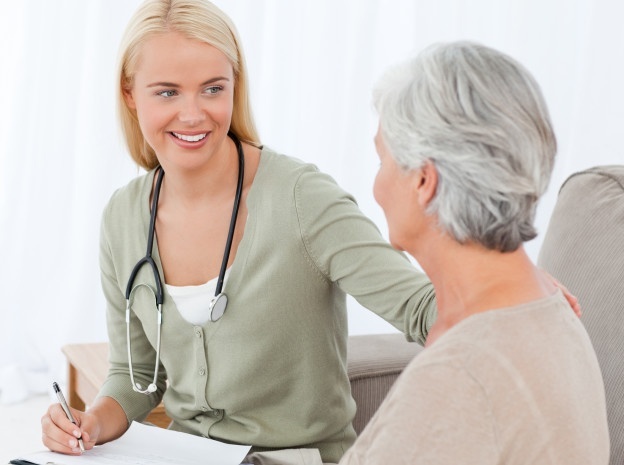 One call to VNA of Ohio connects families to a team of expert homecare clinicians and professionals who cover a wide range of services. VNA of Ohio’s central intake staff is trained to help shepherd families through what can be an intimidating process: finding and securing homecare for loved ones in need. Once initial contact is made, a VNA of Ohio representative will discuss the individual needs of each patient and their family and explain how VNA of Ohio services can meet those needs. Whether the need is for a home health aide to visit twice a week to provide companionship and help with personal tasks or for a fully engaged hospice team, VNA of Ohio has the dedicated staff to meet the need. Attentive homecare professionals know their clients and patients well and are trained to recognize when their needs change. Because VNA of Ohio provides a comprehensive continuum of care, patients can transition easily from one service to another. Lyndsi Rosen, director of business development for VNA of Ohio, said she often sees relief come over anxious family members when they learn how much support VNA of Ohio can provide. "The key question is always, 'Who will pay for this? '," Rosen said. "One of the things we do is help them understand all the parameters for insurance and Medicare coverage." Rosen explained that insurance will cover home healthcare for a defined period of time when a doctor orders the care for a patient who is deemed to be "homebound," meaning they cannot leave home without great difficulty or assistance from others. "That encompasses everything from tiring easily to dementia and requiring assistance with transfers," she said. "After talking with the family and assessing the patient, we get their physician’s name, and the liaison will call the physician personally. We give the physician a snapshot of what's going on with the patient, and generally, they are very receptive to initiating home care services." Rosen said physicians embrace VNA of Ohio’s involvement in the care of their patients, whether they are recovering from illness or surgery, learning to live with chronic medical conditions such as heart disease or diabetes or struggling with mental illness. "We act as the doctor's eyes and ears and make sure their patients make it to their appointments and follow through on their plan of care," she said. But homebound patients aren't the only people that VNA of Ohio can help. Many families find comfort in knowing someone is checking in on an elderly loved one. VNA of Ohio's Home Assist™ provides private-duty services for individuals who need help with everything from personal grooming and light housekeeping to 24/7 round-the-clock care. "When I first meet with families, no matter the purpose of the visit, I always educate them on all the services that VNA of Ohio offers," Rosen said. "It always comes as quite a surprise. There is always a sense of relief when they hear what can be done to help them take care of their loved ones in their home." Learn more about VNA of Ohio home care services, or call us today at 1-877-698-6264. © 2016 Visiting Nurse Association of Ohio. All rights reserved.